At this point in recent years we would all be sitting here reflecting on what was another failed season, throwing around names of players who can walk onto the team and save us from ourselves. Early into the 2013/14 season I think we all knew this season was going to be different, but perhaps unsure of just how different. Most, I think, were very cautious with their predictions on how the season would end, including myself. Even when we were perched up on top of the Premiership week after week, any seasoned Gooner knew that this was Arsenal and nothing comes quite that easy. As it turns out, this season was different and we've got another big, big game to look forward to before we are subjected to Shrek Wayne Rooney and his combover at the World Cup. 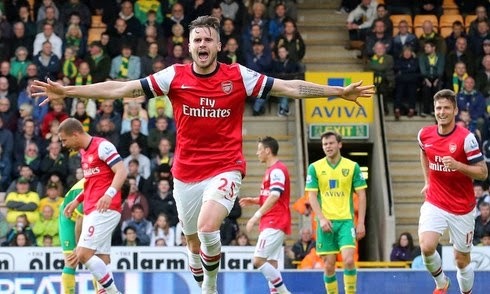 First came the business of calmly disposing of Norwich and ensuring that they play Championship football next season. I'm positive I wasn't the only one thinking this might have been a snoozefest, but we were treated, somewhat, to a positive display from our boys in Red & White. Fabianski in goal must surely mean that the clubs first choice 'keeper, Szczesny will start at Wembley this Saturday. If Szczesny had played against The Canaries then he would have secured the Golden Glove award by achieving the most clean sheets in the league. I think, if I'm not mistaken, he gets to share it with the Chelski guy who still wears a helmet, although it would have been nice for him to win it outright, but I think playing in an FA Cup Final would take precedence. Jenkinson not only started at right back but managed to get his first goal for the club he has supported since he was a young boy. I have to say, I like these stories and you couldn't help but get goosebumps when he ran to the Arsenal support to celebrate his goal. What a moment that must be, and a good confidence boost for the lad as I'm sure he'll be handed further responsibility next season. Aaron Ramsey's goal was, well, just special. I was chatting with fellow Gooner today and we both agreed that it was reminiscent of Henry and that dutch skunk guy. Don't forget about the pass too - props to Giroud for the lovely lob over the defenders to find Ramsey on the far side of the box, only for the flying Welshman to volley it into the roof of the net. Top drawer stuff for any player. Man of The Match, however, should have gone to the traveling Gooners who sang their hearts out for the entire 90 minutes, and some. I didn't listen to a word to the commentators as the Arsenal support was simply enthralling. If getting behind their team so passionately wasn't enough, the best part of the entire game was when Abou Diaby stepped onto the field, after 18 months out injured (and a career littered with injuries) only to be serenaded for the last 20 minutes. Simply staggering, yet not surprising when you listen to what they have traveling to every game with them. If we talk about this season being successful at all then the traveling Gooners have to be in that conversation. While the home support could always improve, no football fan could ever say The Arsenal don't get behind their team when visiting other stadiums. Talk about a class act. Well played. Being so far away from home it's often hard to feel the Arsenal love on a consistent basis - there is a solution! There are many Arsenal fans within the state of Michigan, and just outside Detroit we have a group slowly growing at the Red Fox English Pub in Royal Oak. I implore you to join us if you are anywhere close, and bring the Arsenal love to another level. Bring your voice.